Caen stone of the type originally used to build Canterbury Cathedral is to be used in conservation work there for the first time in 100 years. The stone, from Plain de Caen in northern France, was brought to Kent by the Normans when they built their cathedral in the late 11th Century. 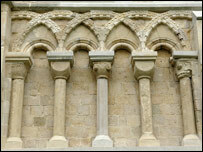 The present building boasts examples of Caen stonework from medieval times. A shortage of supply at the end of the 19th Century forced stonemasons to use poorer quality stone from elsewhere. "We are delighted to be bringing stone from the Plain de Caen back to the cathedral after a long absence," said Heather Newton, head of stonemasonry. "We have now sourced a good supply which is close in structure to the high quality stone used in medieval times. "It will ensure an excellent match with much of the original stonework that remains within the cathedral." Repairs to the cathedral, which the Normans began on the site of an earlier Saxon structure, are under way following the launch last year of a £50m global fundraising campaign. Crumbling stonework and a leaking roof meant parts of the structure would otherwise have to be closed to the public. The Caen stone, which is said to be long-lasting, a beautiful colour and easy to work with, will be used on the work starting on the Corona at the east end of the cathedral. Members of the public are being invited to sponsor individual stones or lead roof tiles as part of the fundraising drive.